In The Healing Promise of Qi, Roger Jahnke. O.M.D., internationally respected doctor of acupuncture and Chinese medicine and best-selling author of The Healer Within, clearly and simply explains Tai Chi and Qigong principles and practices. Rather than focus on one particular method or form, Dr. Jahnke distills the best and most important lessons, learned from Chinese teachers with whom he has studied. With the help of more than one hundred superbly rendered illustrations, Dr. Jahnke teaches you easy-to-learn techniques drawn from among twenty-five traditional and modern forms of Tai Chi and Qigong that he has mastered and taught to thousands of people in workshops, retreats, and health-care institutions throughout North America and China. And instead of offering a one-size-fits-all program, he provides guidelines for tailoring a self-healing and empowerment regimen to your unique goals, age, body type, personality, and medical condition. Qi is the ancient Chinese concept for the source of all vitality, healing, and creativity. For those who are healthy and those who seek healing, Qi is the primary ingredient in the most profound medicine, which is produced for free, naturally within the human body. China's most traditional and powerful healing arts, Tai Chi and Qigong are the most direct route to accessing and mastering Qi. Now, this down-to-earth guide, makes the awesome power of Qi available to everyone through Tai Chi and Qigong. "Qi--the energy that sustains all life, holds the key to health and longevity. 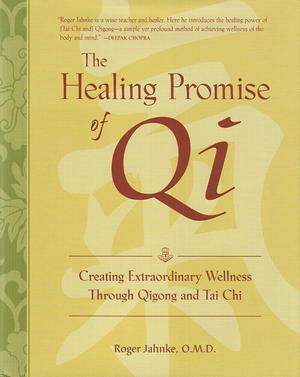 The Healing Promise of Qi shows you how to access this potent force. And that's very good news, indeed." "The Healing Promise of Qi has the power to change your life. Dr. Jahnke not only practices Oriental medicine, he lives it authentically. His teaching is pure and potent, combining mind and heart to give you the practical skills you need to be your best self. This book is a gem that you will treasure for the rest of your life." "The ancient tradition of Tai Chi and Qigong is masterfully revealed in this book. Whether you are new to Qigong or a seasoned practitioner, Dr. Jahnke's insights will add new understanding and depth to your practice." "A timely book of gentle persuasion and clear understanding, with easy-to-follow instructions to guide the readers, step by step, toward the success of achieving health and well-being." Visit the Health Action website - http://www.FeeltheQi.com - Don't forget to come back here to place your order.